On Saturday night, after a fantastic day at the #GBDOC Conference we returned to the hotel with some snacks for the evening to accompany our hilarious game of Cards Against Humanity. Amy bolused for the carbs she was going to eat, putting on a combo bolus and all was set. Hours later we went to sleep in our cosy hotel room, with Amy sleeping two feet away from me in her bed. Within 30 minutes I was woken to a beeping followed by a vibration noise, it was her Animas Vibe pump alarming us to a hypo. Everyone slept through. I checked DexDrip on my phone and could see she was stable, arrows going straight, unfortunately not upwards but fortunately not downwards. I waited. Nothing changed, so I woke her up. 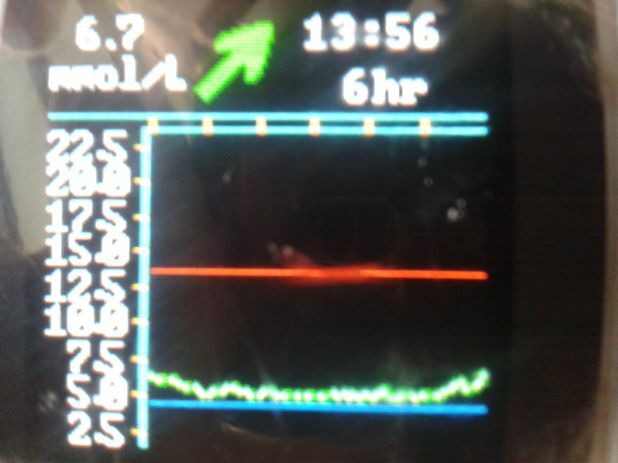 I put on a temporary basal of 0% – effectively turning the pump off – and waited 30 minutes but nothing really changed as she still had some insulin on board. I didn’t understand it though; those Dextro tabs should have brought her up to 7 or 8 mmol. I shined my phone’s light on the floor and there it was, along with the explanation why she was still hypo. So there we have it, toothpaste is clearly not a suitable hypo treatment. * clearly something to do with waking up, becoming active then going to sleep again. At the start of 2013 I only had one New Year’s resolution, which revolved around getting more proactive managing Amy’s diabetes and handing over knowledge to her to let her decide where to go next. I blogged a bit about it here. Honestly, I’m not sure whether this has been fully achieved but I do know that she and her diabetes knowledge, attitude and advocacy towards and for diabetes care has much improved. And realistically that’s all that matters. We started off 2013 getting playing around with different sports and she’s pretty much found that she prefers Squash and Badminton and is pretty good at the latter. Cycling has featured a fair bit and she successfully cycled 27 miles with Gavin’s GBR30/30 challenge this year. The good that’s come out of this is that she’s proved herself to be better, stronger and more determined to achieve than many of her peers and I have no doubt that diabetes has raised this drive and determination. Having attended so many diabetes related events Amy has gained a lovely set of friends in Chloe, Mimi, Max and Harry, friends I hope will stay in her life for a long time, such is the positive effect it’s had on her attitude to feeling ‘normal’. Her own friends are great but there’s nothing like being able to speak to other kids who just understand. Getting the insulin pump has been one of this year’s big achievements, from fainting at the mere mention of cannulas at the start of the year, to getting a pump in June and on to giving cannula change demos in public to soon-to-be-pump-wearers she barely knew. So 2014 is almost here. I have no doubt it will match or exceed the good things which happened in 2013. I have no doubt about this because we have so many wonderful people in our lives, in our family, locally and especially within the Diabetes Online Community. Thank you to all of you. I’ll leave you with a picture of Amy with her much-awaited new shirt from Diabetees.